Once I decided to run the Tom King Half, I knew that the Cedars Frostbite would make for a perfect training half. It’s held exactly a month before, which is when I’d be putting in a 13 mile long run anyway. And it’s only $8. Heck yeah, I’ll pay $8 to get water stations and some free food after my long run! I just had to make sure not to run it too fast, especially considering that the Hot Chocolate 15k was the following weekend. I did want to use the race to test a new fueling strategy. For the Country Music Half, I fueled twice, around the top of each hour of running. I wanted to try fueling three times: every 30-45 minutes with the last two being caffeinated gels. The Cedars Frostbite has only three water stops (miles 3.5, 7, and 10), so it made choosing when to fuel fairly simple. See a water station coming up? Time to eat. The race wasn’t until 11am, so I got to wake up at a reasonable hour. The weather was amazing for February: mid-50s warming to lower 60s and sunny. I chose to run in shorts and a short-sleeved shirt. There was no packet pickup ahead of time, so I was aiming to get there an hour or so early in order to be able to park, get my bib, and then use the restroom if I needed to. I plugged the address into Apple Maps and was off. Except Apple Maps still isn’t always very correct, as I turned around at a dead end. There was a car behind me doing the same thing, so I figured they were using the same GPS. Then my GPS told me to turn down a gravel road. Nope. I kept going. I finally ended up in the right spot. When I finally parked, I asked the other car if they had been using Apple Maps. They said they had just been following me. Heh, sorry! 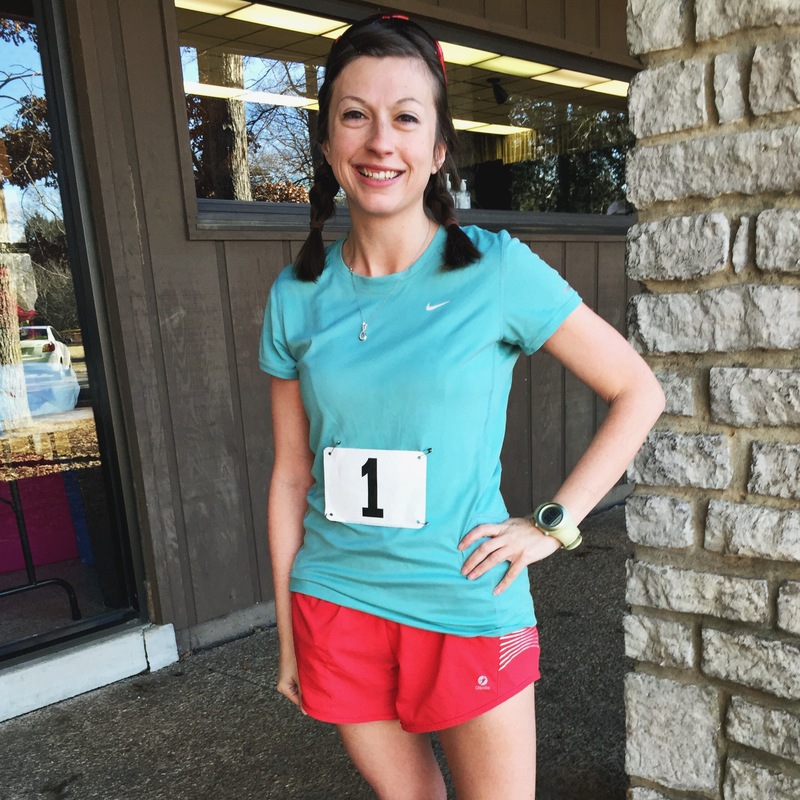 I walked down to the start and went inside to get my bib — I was #1! This, of course, called for a photo. I didn’t need to use the restroom, so I just stood inside to stay warm before heading out to the start line about 5-6 minutes till. I didn’t warm up because this was supposed to be a training run. I was very committed to keeping this like a training run. So I did not look at my watch, except to glance at the lapsed mileage so I would know approximately when to take my gels. I also took a walk break for 30 seconds to a minute at the start of each mile (unless I had just passed a water station). I felt very weak and shaky at the start of the run. I felt like I was running through molasses. My form seemed off. 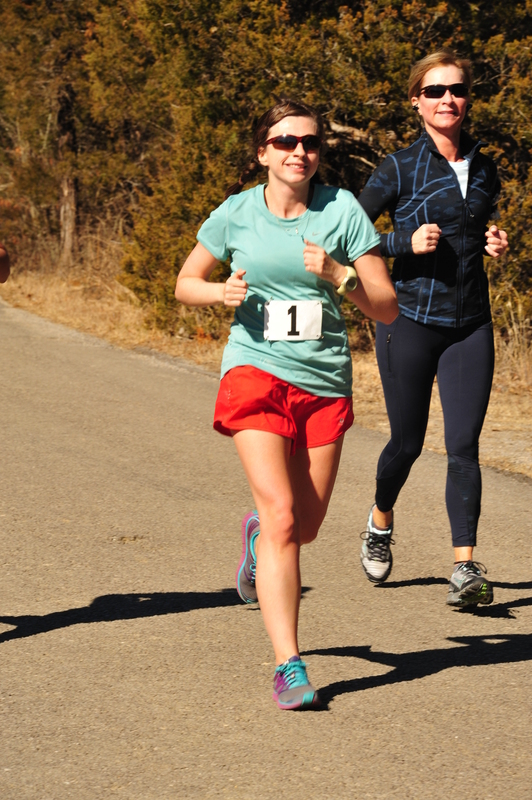 This photo, taken around mile two, shows how unrelaxed I was. Need to lower those shoulders! I took my first gel, a strawberry one, shortly after the start of the fourth mile. We were soon upon the first water station, so I took a quick break there instead of at the beginning of mile five. Right after the water station, we headed up a gravel path for the next 3-4 miles. After we got off the gravel path, it was time for another gel and another water station. This time I took a lemonade one, which is caffeinated. It was yummy! Tasted just like lemonade. And when I reached the water station, the flavor in my mouth made the water taste like Gatorade. Mile 10 was my slowest because I took a longer walk break to down my last gel. It was a chocolate one and was thicker than the others, so it was harder to down it while running. It was tasty, though! It was around this time that I did actually glance at my watch. I only had 5k to go, and realized with some surprise that if I kept my pace steady, I would actually finish in under 2:15. The last few miles were rough. I knew all I had to do was keep under an 11 min pace, but that felt like a monumental task at the end of a half marathon. 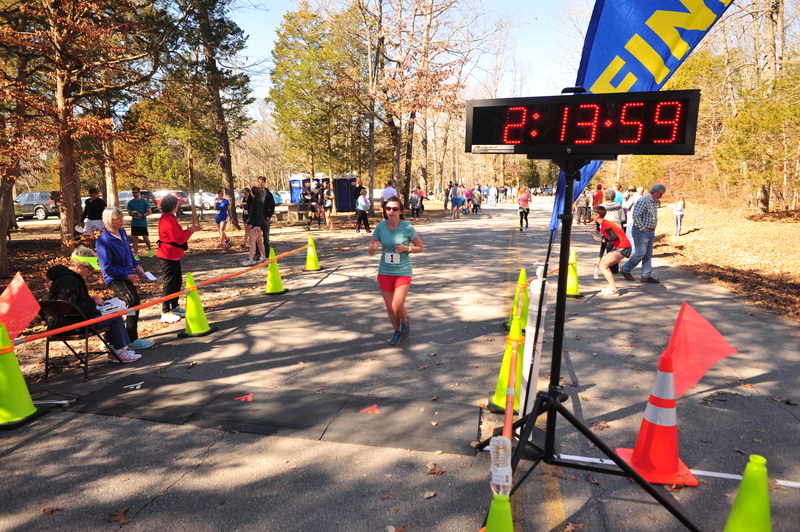 When I saw 2:13 on the clock as I was nearing the finish line, I couldn’t believe it. I didn’t have enough in me for a finishing sprint, so I just mostly maintained my pace through the finish. I immediately grabbed a water and walked to cool down a bit. I did everything I could think of to keep this like a training run. I didn’t taper. No warm up. Didn’t look at my watch. Walked every mile. Plus the entire course felt uphill! And there were miles of gravel trail! Uphill gravel trail! With muddy potholes! What am I actually capable of running when I try to race a flat course? I actually enjoyed this race more than I thought I would. I normally like urban races with lots of crowd support. Maybe it was because I had the mindset of it being a training run, but it was actually quite peaceful being in the middle of nowhere. Yes, the course is hilly. It feels like the downhills never make up for the uphills. 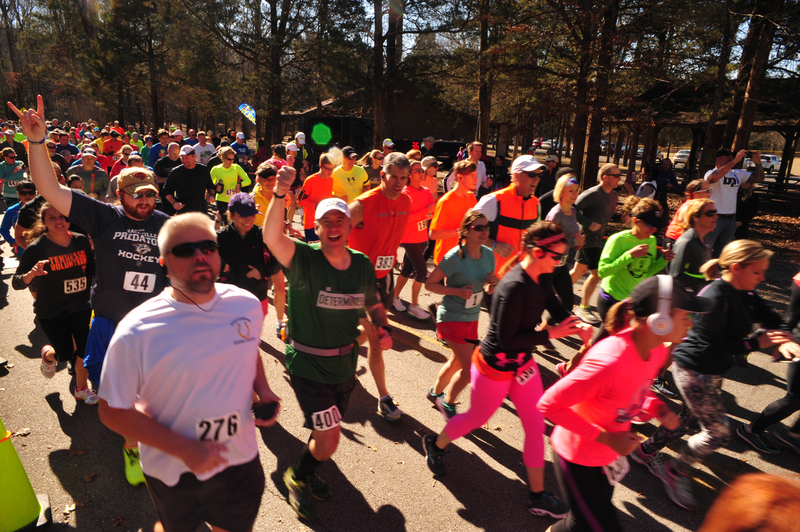 And, yes, there are about three miles where it’s nothing but a narrow gravel trail and is covered in potholes, so you have to constantly weave to avoid them and other runners. And there’s no medal. Which didn’t bother me at first, since I wasn’t planning to PR, never mind beat my goal for the year. Now I want one. Maybe I’ll consider my Beat the Blerch Virtual Race medal to be the one for this race. I didn’t even buy the t-shirt. 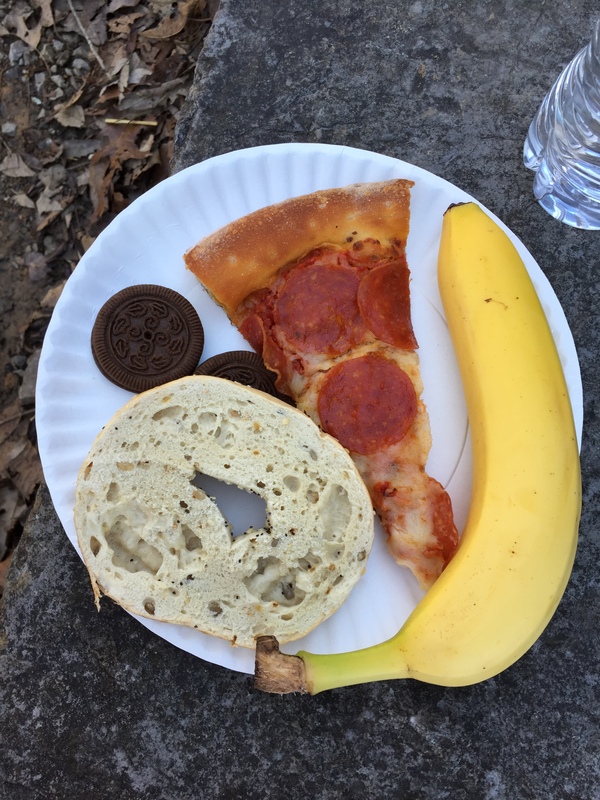 The food was okay: bagels, bananas, pizza, and cookies. I am not a Papa John’s fan, but even it tasted good after running 13 miles. I’m not quite sure what there is to analyze, since I never really felt like I was racing. I was stiff most of the race, due to cumulative fatigue from not tapering. Again, it just makes me wonder what I could do in optimal conditions. This entry was posted in Race and tagged cedars frostbite half marathon, half marathon. Bookmark the permalink. ← Treadmill Speed Work: How can you tell improvement?